The prevention and defense of fire in commercial kitchens is critical. CORE Protection is designed to provide primary coverage for hood plenum, grease ductwork and cooking appliances. The CORE Protection Fire System is ETL Listed under Report number 3132231SAT-004 to UL Standard 300 and ULC/ORD-C1254.6-1995; meets requirements of NFPA 96 (Standard for the Installation of Equipment for the Removal of Smoke and Grease-Laden Vapors from Commercial Cooking Equipment); NFPA 17A (Standard on Wet Chemical Extinguishing Systems). Robust and reliable protection is provided by two main components: Total Flood Protection for appliances and Duct & Plenum coverage. Total Flood offers simplified piping and nozzle placement to cover all appliances in the hazard zone under the hood. Duct and Plenum coverage is provided via a spray bar that extends the full length of the hood immediately behind the filters in the hood. 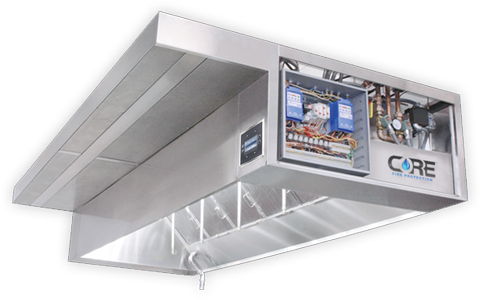 The spray bar also provides automatic washdown of the duct and plenum to minimize grease build-up in the hood plenum and duct.